So I can't believe that I am going to admit to this, but about two weeks ago, I went to see Safe Haven. Perhaps my feminine tendencies toward the sappy were taking over, and then next thing I know, I'm sitting in a dark movie theater with a little bag of popcorn and some soda. And I'm watching a Nicholas Sparks movie. And then I'm driving home and thinking to myself...I actually liked it. Not because it was brilliantly done or destined to win awards. Oh, and then I guess that must have triggered more of those sappy female tendencies, and the next thing I know, I'm thinking...I should actually give him another try. I did. I admit it. And there you have it. I'm reading a Nicholas Sparks novel, and I honestly hardly know how it happened. Except that I'm calling it a phase, and I know it is a phase that I may pass through again. Because deep down in my little girl heart, I am a sucker for romance. In all its forms. And there is no point in denying it. And the sad thing, in my opinion, is that the story had some real potential. I know I'm giving it 3 stars, and that is mostly because I liked it enough to finish it, and I did want to see what happened...at least mostly. And I'm feeling generous. 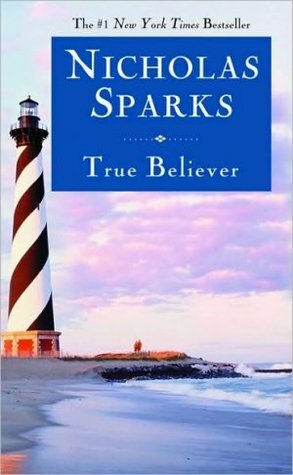 And Nicholas Sparks actually seems like a nice guy. However, should one of these sappy moods strike me any time in the near future, I beg of you to help me find something better. No Shades of Grey, mind you. Just some nice, chaste romance. That is all. Sign into Goodreads to see if any of your friends have read True Believer. You know I like this review! Melanie... You really do know how to write some excellent chemistry! And Jami, lets get together next week for sure!